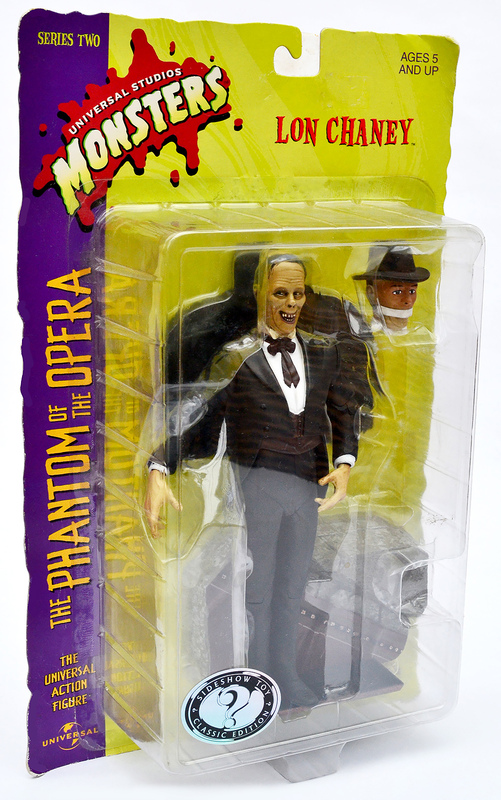 Universal Studios Monsters: The Phantom of The Opera action figure by Sideshow Toy (1999) | 'TAIN'T THE MEAT… IT'S THE HUMANITY! Universal Studios Monsters was a collection of posable action figures released by Sideshow Toy between 1999 and 2001. The 15 figures in the collection featured realistic interpretations of some of Universal’s most iconic movie monsters, and the actors who portrayed them. Over the last few weeks I’ve been taking a closer look at the collection, and this week it’s the turn of Lon Chaney’s classic interpretation of The Phantom of the Opera, based on the film released by Universal in 1925. The Phantom of the Opera is considered one of the true gems of silent cinema, thanks in no small part to Chaney’s iconic portrayal of the Phantom. Based on the popular novel by Gaston Leroux, the film deals with the disfigured and insane Erik (Chaney), a murderous criminal who terrorises the staff of the Paris Opera House. Erik is obsessed with Christine (Mary Philbin), a rising star of the Opera Company, and he blackmails the Opera’s management into advancing her career. Erik eventually kidnaps the girl and takes her to his underground lair in the bowels of the Opera House, where she is eventually rescued by her sweetheart (Norman Kerry). An angry mob, tired by the Phantom’s murderous spree, then chases Erik through the streets of Paris before beating him to death and throwing his body into the River Seine. In preparation for the film Universal built some truly impressive sets, including the Opera House’s main stairway, and the cavernous canals under the building. Chaney created the Phantom’s memorable makeup and the scene where Christine tears of his mask is easily one of the most iconic in film history. The film’s production was not an easy one however, with original director Rupert Julian being removed after his original cut of the film faired poorly when previewed. A second director, Edward Sedgwick, reshot the bulk of the film, but his comedic take of the subject matter faired even worse with preview audiences. Universal then re-edited the film, reinstating much of Julian’s footage. Despite its troubled production the film proved a great success for Universal, who reissued it five years later with a new audio track to capitalise on the invention of sound. The Phantom of The Opera is undoubtedly Lon Chaney’s most famous cinematic role. His groundbreaking, and at the time shocking makeup showed how he’d earned the moniker The Man of a Thousand Faces. 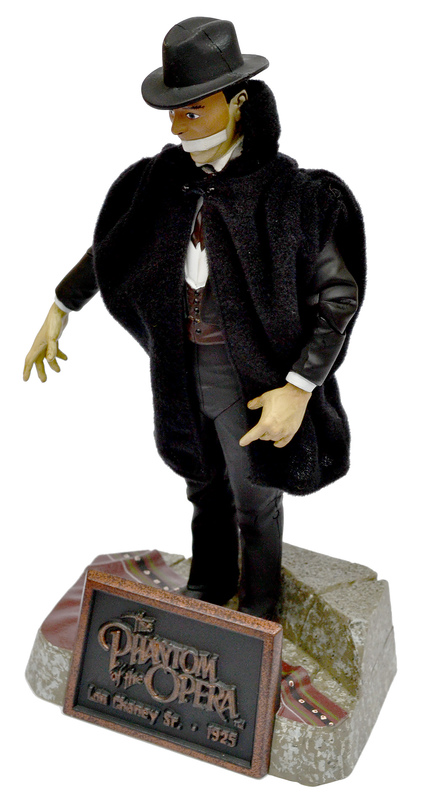 This action figure was the first of three from the Universal Studios Monsters collection to feature the actor: The Hunchback of Notre Dame appeared in Series Three, while his appearance as The Masque of Red Death (also from The Phantom of The Opera) featured in Series Five. 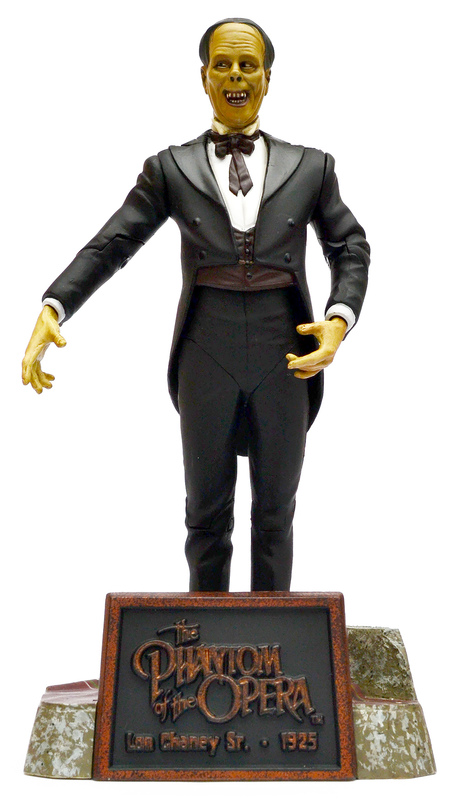 The Phantom of The Opera action figure was released by Sideshow Toy in 1999, and formed part of Series Two of the collection. The figure was made from painted moulded plastic, boasted 12 points of articulation and stood 9½ inches tall when placed on its base. The figure shipped in a cardboard-backed blister pack, the back of which featured a brief synopsis of the film and showcased the other action figures available at the time. 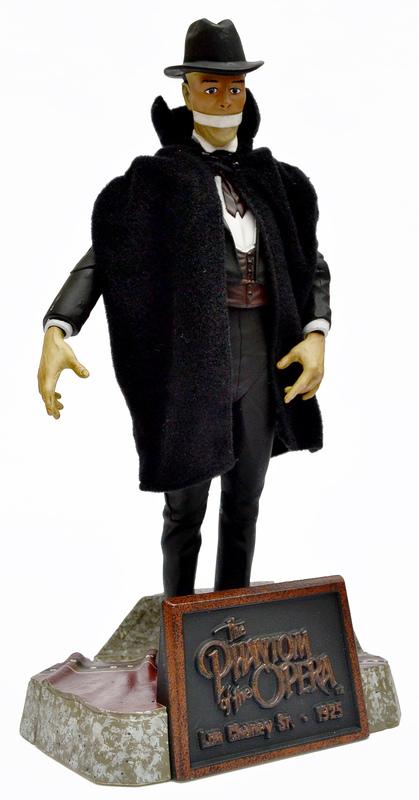 The figure came with two accessories: the Phantom’s black overcoat and a separate head with Erik’s mask and hat. Also included was a base with a nameplate that featured the film’s legend. The Phantom with his coat and ‘spare’ head. 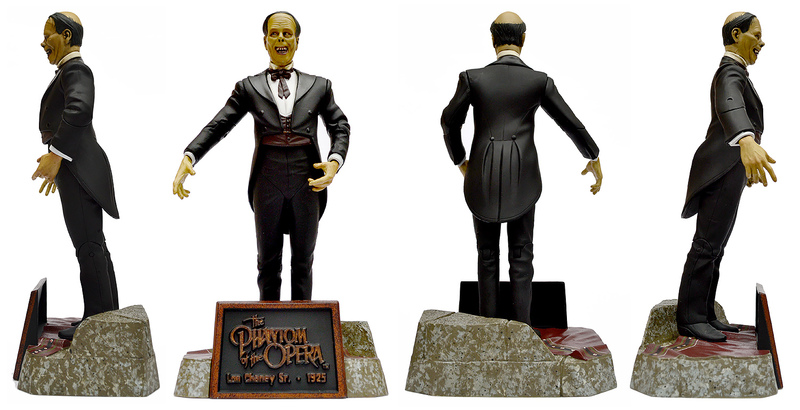 The Phantom of The Opera action figure was based on a sculpt by regular Sideshow Toy artist Mat Falls. Falls did a great job on the Phantom. His depiction of Chaney’s face is both accurate and wonderfully detailed — he got the Phantom’s insane grin just right. There’s also some great detailing on the folds of the figure’s clothes and on its hands. The paintwork is also of a high quality, especially on the face and hair — this really is a terrific action figure. Sideshow Toy released three versions of this action figure — two on purpose and one by mistake. There were two planned editions of the action figure: a coloured version (or Classic Edition) and a black and white Silver Screen Edition. When the coloured version was first released the figure’s tie and cummerbund were mistakenly painted dark red, instead of bright red. Sideshow Toy then re-released the figure with the correct paintwork. The Phantom of The Opera, from all sides. 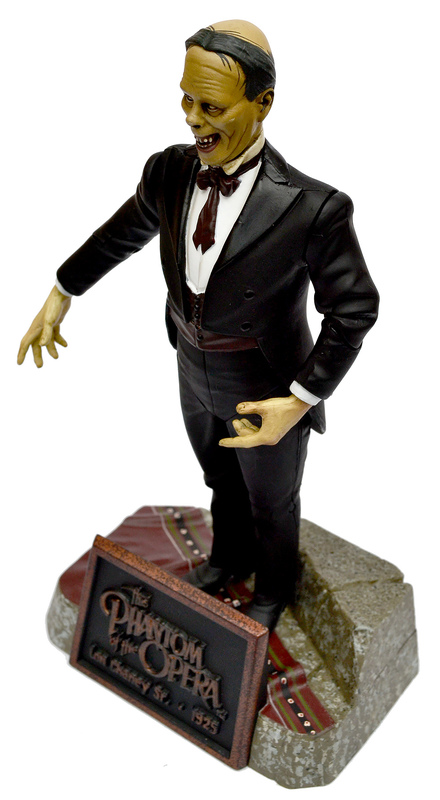 Due to it’s age The Phantom of The Opera action figure by Sideshow Toy is well out of stock. New copies can still be found on ebay for a reasonable £25/$35. 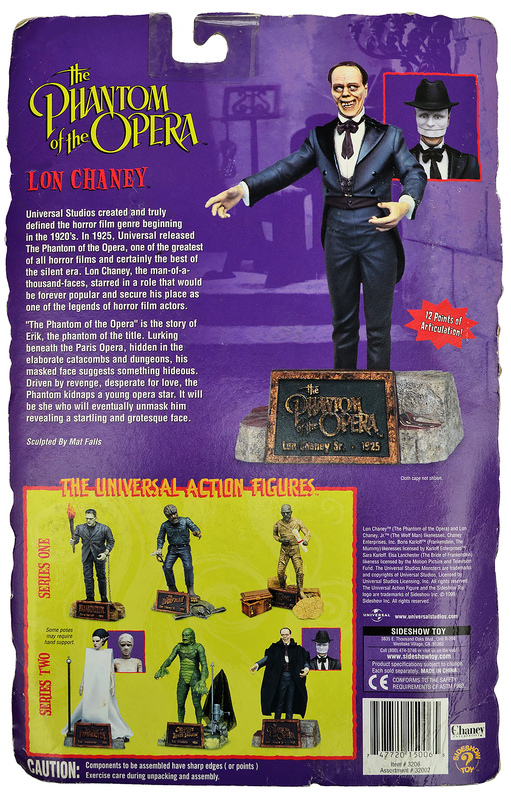 Chaney fans will no doubt delight in the action figures attention to detail, while casual fans of Universal Studios’ monster films will also find a great deal to enjoy. Next: The Mole People action figure.